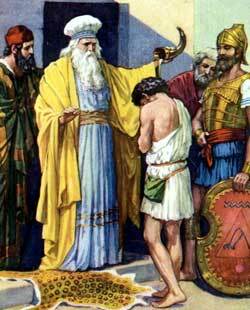 Samuel anoints David, the shepherd boy, to be king of Israel. WHEN SAMUEL WASvery old, he made his sons judges, with himself, over Israel. But his sons took bribes, and did other things that they ought not to have done; and the people of Israel became so discontented, that they came to Samuel and desired him to give them a king in place of him and his sons. Samuel was grieved at this request; so he prayed to God to know what he should do. And God was displeased with the people for wishing to be governed by a king, like other nations, when He Himself was their king. Nevertheless, He gave them leave to have one, and told Samuel whom he should choose. This was Saul, the son of Kish, a man of the tribe of Benjamin. At first Saul was a good king, and did all that God commanded him. But he soon became disobedient; and as he persisted in ill-doing, God, who was patient with him for a while, at last determined that one more worthy than he should be chosen to be king after him and whose children should succeed to the throne in place of Saul’s children. So God bade Samuel to take a horn of oil, and go to Jesse, an Israelite who lived at Bethlehem, and anoint one of his sons, whom He would point out to him, as the future king over Israel. Samuel was afraid of doing this, for he thought Saul, if he knew it, would put him to death. But God bade him go and offer a sacrifice at Bethlehem, and He would show him what to do. So he went and called the chief men of the town, together with Jesse and his family, to the sacrifice. Then Jesse made his sons pass before Samuel, who, when he saw the eldest son, Eliab, a tall, fine-looking man, thought he must be the one whom God would choose to be anointed king. But God said He would not have Eliab; for He looked at the heart of man, not at his outward appearance. So seven of Jesse’s sons one after another, came before Samuel, and none of them did God choose. Then Samuel asked if all Jesse’s children were there. Jesse answered he had one more son, David, the youngest, who was away keeping sheep. So David was sent for. He was a beautiful youth, with golden hair; and as soon as he came, God bade Samuel anoint him, for he was the one whom He had chose. So Samuel anointed him king. And the Spirit of God then came upon David, and remained with him from that day.